Sunrise Bank Limited is a fast growing “A” Class Commercial Bank with diversification to various areas of functions and with rapid branch expansion target across the nation aims to increase the pace of quality growth. In this process the bank requires a pool of competent Human Resource to surpass the targeted quality growth in an effective, efficient and sustainable manner. 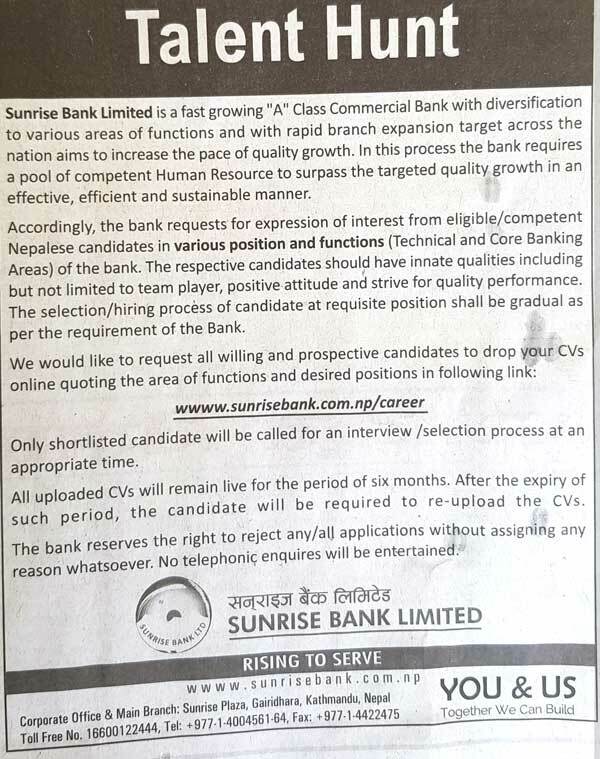 Accordingly, the bank requests for expression of interest from eligible/competent Nepalese candidates in various position and functions (Technical and Core Banking Areas) of the bank. The respective candidates should have innate qualities including but not limited to team player, positive attitude and strive for quality performance. The selection/hiring process of candidate at requisite position shall be gradual as per the requirement of the Bank. Only shortlisted candidate will be called for an interview / selection process at an appropriate time. All uploaded CVs will remain live for the period of six months. After the expiry of such period, the candidate will be required to re-upload the CVs. The bank reserves the right to reject any/all applications without assigning any reason whatsoever. No telephonic enquires will be entertained.